My friends have made fun of me for years but I don’t care. I love Neil Diamond. There, I said it. And I’ve loved him for a long, long time. It all started when my older brother gave me his entire record collection as a Bat Mitzvah present, which come to think of it, was a pretty sweet gift. 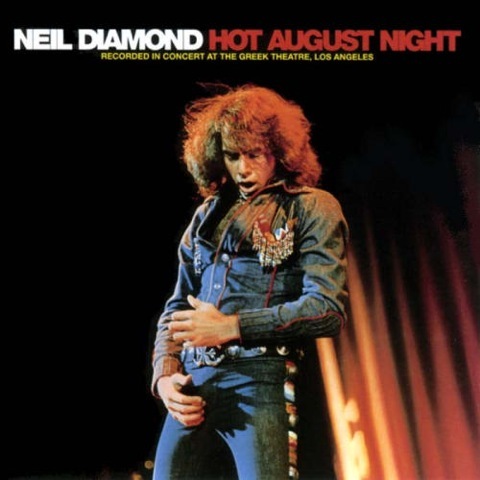 And out of all his records, I liked “Hot August Night” the best – a live recording of Diamond singing his songs on, well, a hot August night in 1972 at the Greek theater in LA. Say what you will about his later, schmaltzy stuff and those shiny dress shirts he wore — back in the 70’s, ND was one cool dude. He wrote songs like nobody’s business, and he shines at the Greek in such classics as “I Am … I Said” and “Holly Holy”. And I’m sorry, but how could anyone listen to “Cherry Cherry” and not grunt along and love it? There’s the occasional silly stuff (“Porcupine Pie”? ), but check out his “Red, Red Wine” and “Solitary Man” before they were covered by younger pop stars. Listen to the romantic “Play Me” or the lovely “Canta Libre” and even “Sweet Caroline” before it was over-played at Fenway Park. His voice is strong and soulful, his band is tight, and listening to this old album almost erases the memory of his god-awful remake of “The Jazz Singer” with Laurence Olivier. Huuuh!